I’m delighted today to feature an interview with Brigitte Girling from Moss & Stone (pictured left below), together with stunning images from her ‘A Winter Gathering Workshop’ with Kate Hargreaves from Tangle & Thyme (pictured right below), which took place last November. 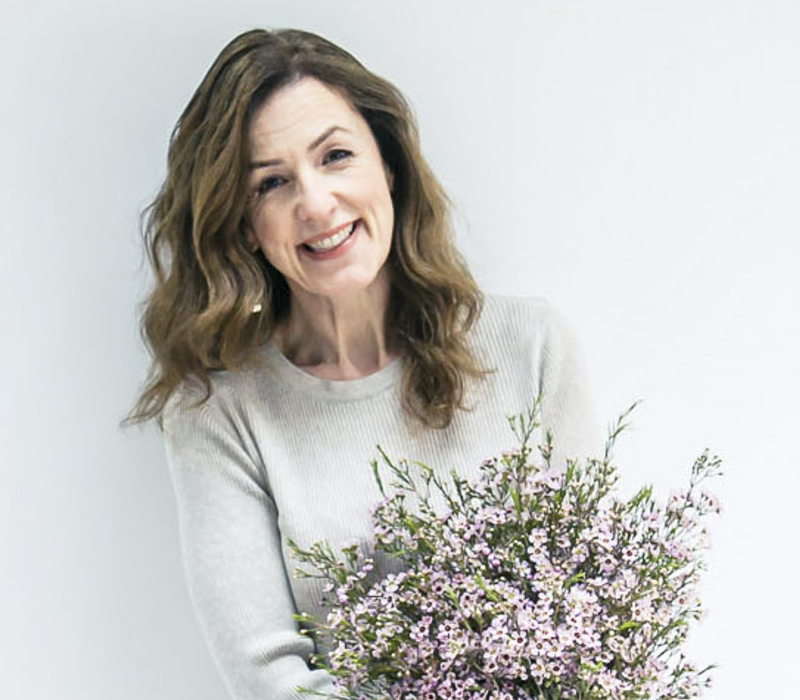 How did your workshop with Kate from Tangle & Thyme come about? 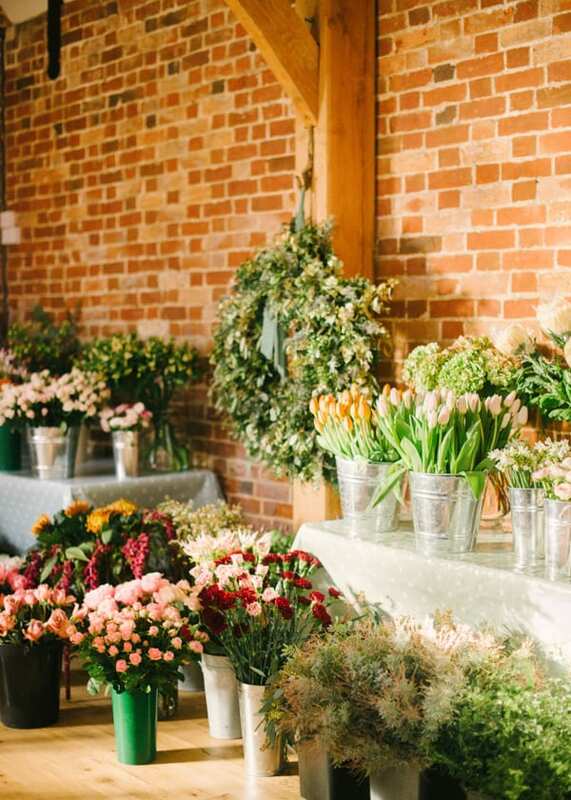 Kate and I first met at the Flowerona Branding for Florists workshop a year a half ago. This course was instrumental in providing the opportunity for several of us to meet for the first time having known each other on Instagram. Claire Bowen (Honeysuckle & Hilda), Lucy Hunter (Lucy the Flower Hunter), Carol Lannigan (Painterly & Blooms), Kate Hargreaves (Tangle & Thyme) and myself seemed to gravitate towards one another and connect. 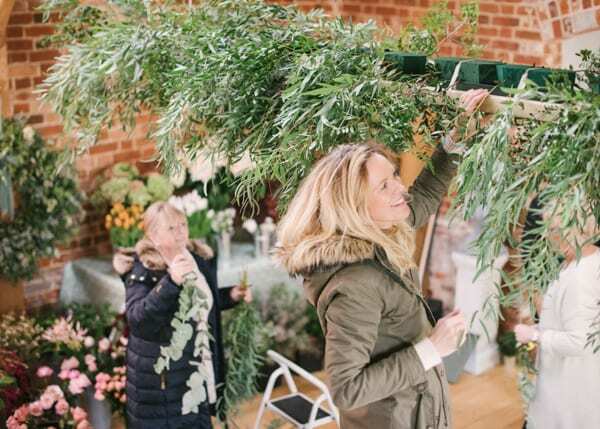 We couldn’t have known, but this was the start of true friendships that have grown, developed and expanded into a really supportive, network which now includes several other wonderful florists. Over that time, we’ve all helped each other out in various ways work-wise and got together socially. And this looks like an on-going trend that continues to strengthen. Kate then attended one of my workshops last summer and she told me all about a recent garden design course she had been on, where she was fortunate enough to gain some hands-on experience at Sissinghurst. This is a garden that frustratingly I haven’t yet visited but is top of my list! She then explained that she was now in the process of designing and creating a new cutting garden at her home in Essex. So, a visit to her lovely garden seemed a must! Over lunch, Kate told me all about her plans to grow and develop workshops in her beautiful studio space and she asked me if I would be interested in co-hosting one with her at the end of the wedding season. And so our ‘A Winter Gathering Workshop’ was born. I feel certain that our story of friendship growth and finding ‘our tribe’ through you and your blog is not unique. There must be many other stories like this as a result of the Flowerona influence. You have created an environment through which beautiful connections can and have been made and where the ethos is not competition but support and encouragement. 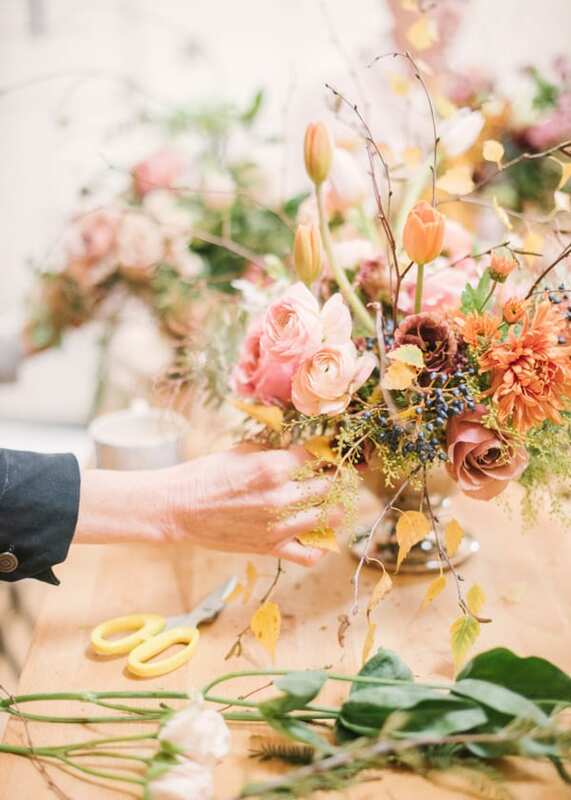 Our workshop in November happened as a direct result of your influence and support for our floral industry as a whole. 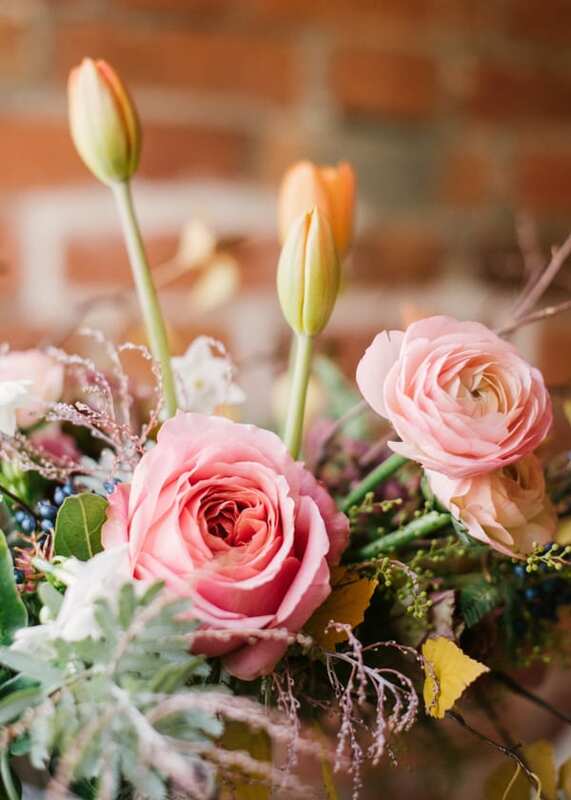 I sense there is a new wave of positive support, collaboration and encouragement that has developed within floristry where social media, Instagram and your blog have played an intrinsic part. Long may it continue! Where did the workshop take place? 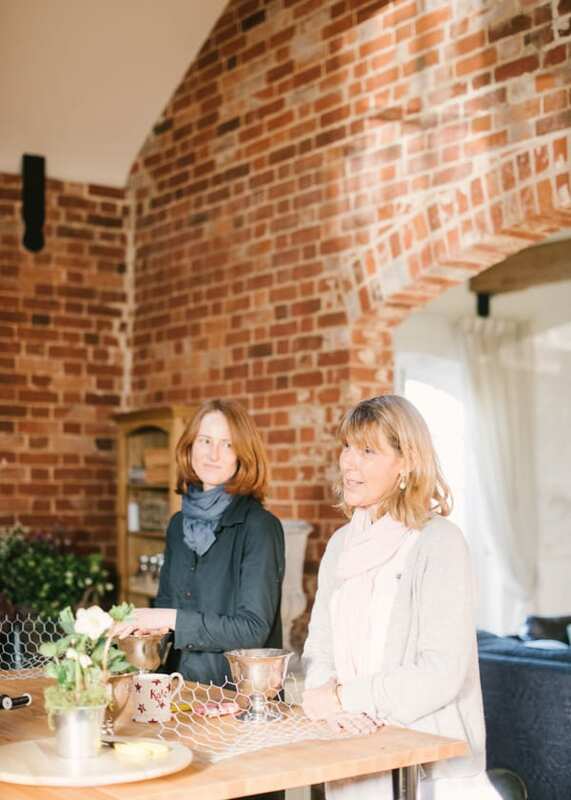 Kate has a beautiful converted old brick stable block where she hosts her workshops near Great Dunmow, Essex. 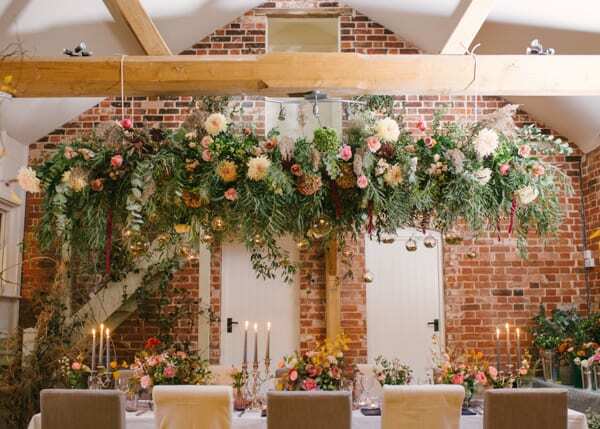 I think many of us florists can suffer pangs of workshop envy but this one really is special and was perfect for the workshop we had in mind. On the workshop day, we woke to a glorious spangled heavy frost and blue skies. It was picture perfect but oh so chilly! However, fortunately Kate’s space has a glorious woodburning stove, so quite quickly we had a lovely cosy atmosphere into which we could welcome our guests. We had a wonderful group of florists who joined us for the day, all with varied experience and interests. Julie King (Peonies & Posies) who writes a garden blog and is passionate about her stunning cutting garden and using seasonal flowers, Sarah Statham (Simply By Arrangement) who holds the most wonderfully inspirational floral workshops from her ’small corner’ of Yorkshire, Ruth who once owned a beautiful hotel on the West coast of Scotland and did all the hotel flowers there for nearly thirty years, Sarah Whiting (Nettlewood Flowers) a talented flower farmer and florist from Teddington, Jen Sayers (Foxtail Floral Design) who is a skilled freelance florist from Suffolk and Helen Jackson (Petal & Pot), a lovely wedding and event florist based in Walthamstow. What was the format of the workshop? 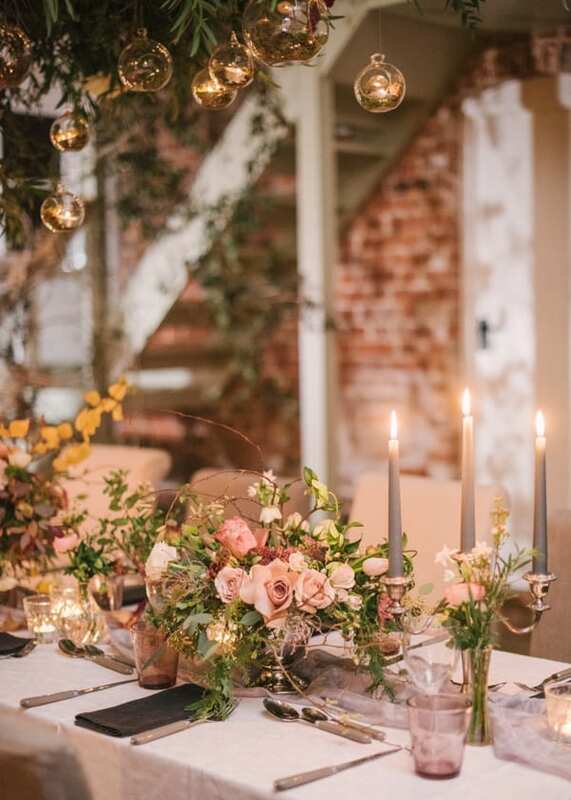 We wanted to celebrate the end of a busy floral year with our attendees, create some beautiful centrepieces and construct a gorgeous floral installation setting within which we could enjoy a candlelight celebratory dinner, swap stories and cement even more new friendships. We all worked together collaboratively to make our fairytale setting. 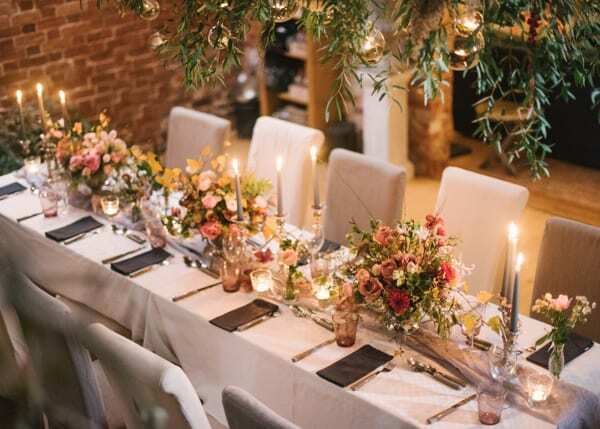 Kate and I started off by talking about our design philosophies – we both prefer to use good old-fashioned chicken wire and water for our table arrangements. We feel that it allows for a more natural, garden style feel and the flowers seem to be much happier too! We also prefer to use British grown seasonal flowers whenever possible. In late November, this was of course not entirely possible but we incorporated many dry seed heads, grasses, foraged finds and branches to give a natural seasonal feel to our designs. 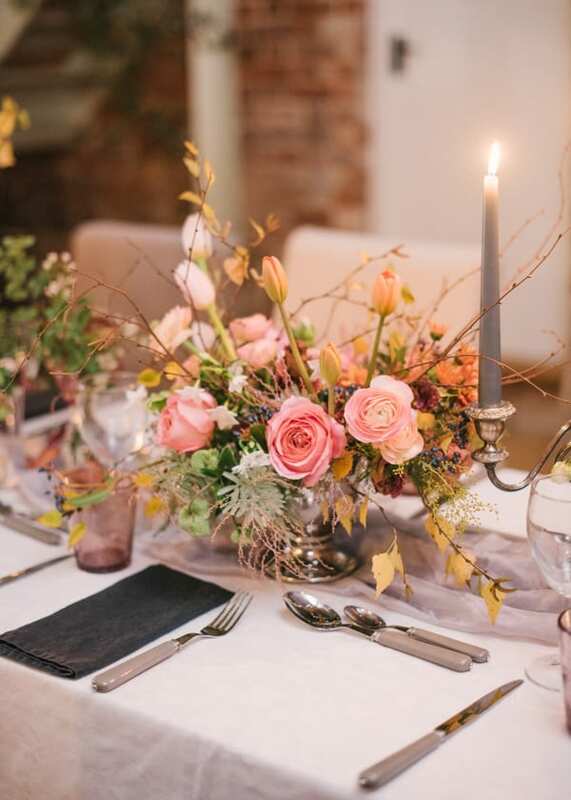 After a quick demonstration by us, our guests then had plenty of time to enjoy creating their tablecentres that would run down our evening tablescape. 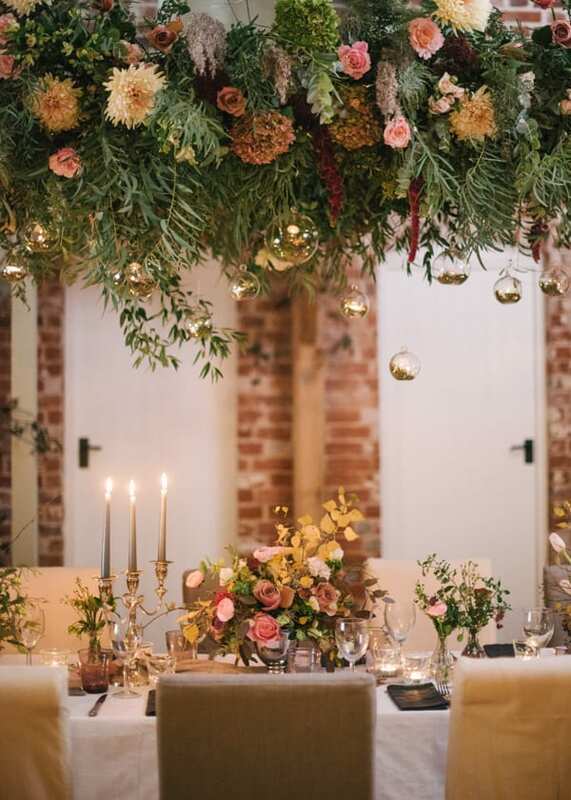 A light home-made lunch of warming soup followed before we embarked as a group on our hanging installation – a floral plank with hanging candle-lit baubles, which would sit above our table. It was lovely to see true collaboration, discussion, respect and friendships blossoming as we worked. After a welcome cake break, we broke into smaller groups to freestyle and create more organic, natural installations around the space. A tumble of my favourite foraged creeping vine, old man’s beard, festooned the stairs and wonderful branchy and brackeny creations began to creep up the walls. Later whilst enjoying canapés and fizz, we created our floral tablescape. We then lit the candles and sat under our beautifully atmospheric backdrop and enjoyed each others company, warming food and glass of wine or two until quite late into the evening! To top it all, this lovely day was recorded by the super talented fine art photographer Hannah Duffy. Hannah and I had worked together before and she generously agreed to come and spend the day with us capturing our ideas and designs coming to life. I was so delighted with her images – a feast for the eyes! Could you tell us about the workshops which you’re planning on holding this year? Kate and I plan to co-host another workshop this year but it will probably be late summer once her new cutting garden is fully underway and brimming full of flowers! We will keep you posted! I really enjoy my one to one workshops and they’re available throughout the year. 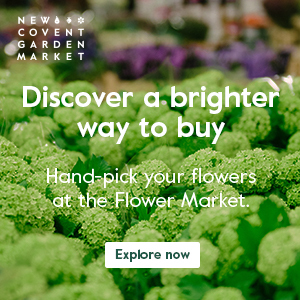 Guests can choose what they would like to spend the day focussing on and then we get thoroughly immersed in all the flowers the season offers. 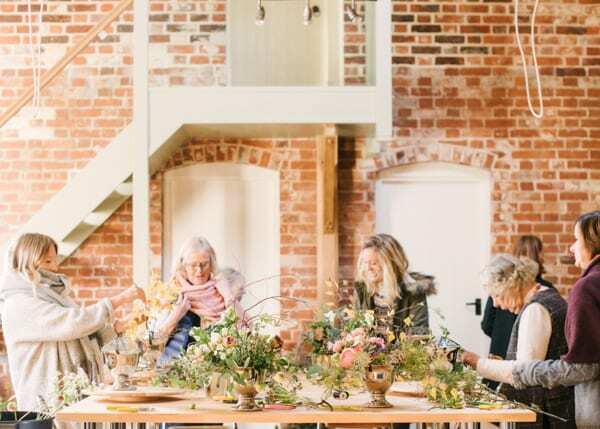 I’m also running a series of workshops with Julie of Peonies & Posies from her glorious cutting garden in Suffolk, the first one ‘Gather & Grow Hellebores‘ took place last month. 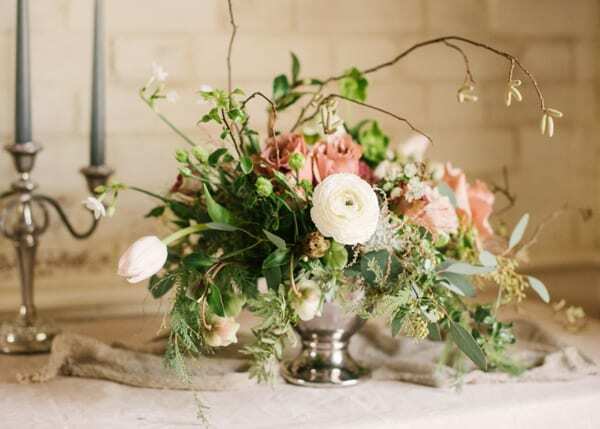 Then I’m hosting ‘The Folly of Flowers – Spring Edition‘, a rather special foam free installation workshop on May 15th with Sarah from Simply By Arrangement in a romantically remote folly in Suffolk. All are available through my website. There are other very exciting plans for collaborative workshops in the pipeline which I will add as soon as the details are firmed up. I just love holding workshops! Kate will also be running more workshops from her beautiful space this year. Her new website is under construction but if you would like more information, you can contact her by email or through Instagram. Thank you so much to Brigitte for all her help in compiling today’s blog post. If you’d like more details about her upcoming workshops, please visit the Moss & Stone website. And of course, do pop over to her gorgeous Instagram account to see her latest designs.